This is a statement I have heard from so many of my clients and readers. 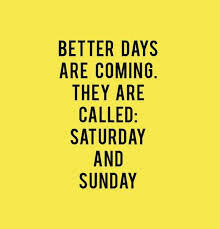 We seem to be able to follow our best fitness and nutrition plans during the week, but when the week-end rolls around our inner teenager takes over. The inner teen wants to eat, drink, and loaf with abandon, but if you want to be leaner, fitter, and closer to your goals on Monday, you need a plan for Saturday and Sunday. What has worked for me and my students is the substitution of leisure and fun for food and drink. I adore going to movies, plays, comedy shows, and museums. Reading, gardening, catching up with friends, learning something new, even enjoying social media can be relaxing without physical consequences. I believe that as a society we have poured too much of our hope of pleasure and enjoyment into food, and we have stopped getting our kicks from playing sports, dancing, and going to concerts. Even when we do get out and amuse ourselves, food has become part of the entertainment. The way to shift fun back into living instead of eating is to start being aware that we are doing just that. 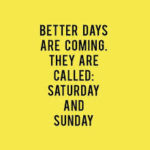 May I suggest that on the week-ends we decide to enhance our health by seeking out the activities that make us happy. Starting Saturday, May 6th, I will begin teaching Cathy’s Fit Class at Sol-Y-Breath in Sonora. It’s located at14709 Mono Way, Sonora, CA 95370, near Sears. This class is gentle, restorative, and fun while keeping us mindful of our commitment to fitness. I have designed it for the true beginner, or for anyone who wants gentle conditioning, but it is also a way to stay engaged with your health goals one one of those days when it seems easier to let all of your good plans go. The cost is $10, or you can use your Sol-Y-Breath yoga card. Tuna salad made with celery, home made mayo, 1t mustard, and chopped raw almonds. Green Beans with garlic sauteed in butter. Stay true to you goals and feel fantastic on Monday. Especially if you eat well, and go to Cathy’s Fit Class. Yes! Catherine’s Body Workshop is coming. Saturday April 23rd at 3PM. there will be an orientation meeting for new students at the studio: 291 S. Washington St.
Then, M onday through Friday at 5:30PM from April 25th through May 6th participants will follow my newly designed training program. In addition, my latest meal plans will be available, including a 2 week vegetarian plan. This will be a test of a brand new format so I will be taking a maximum of 5 new clients. Current members are welcome to sign up at no extra charge, but you must commit to attending the 5:30PM session. This workshop is best for those who are currently training or exercising on a regular basis. The goal of this 2 week workshop is to get you visible results fast. Because this is the first time I have ever offered this workshop the fee for this brand new system will be only $29 for new clients. It will never be this low again, and I am offering a money back guarantee. My promise? You will drop at least one size in 2 weeks. This is the program I use to get ready for photo shoots and public appearances. You can use it to get ready for your special events too. This the beginning of a beautiful new relationship with your body. Away we go with another Total Body Challenge at Gordon Studio. These challenges were instrumental in helping our clients lose over 1200 pounds and inches in 2015. This year, we’re going for 1600 pounds and inches, from our in-person clients, and ten times that from readers of Sugar Freedom, and this blog. When I opened Gordon Studio, and then when I published Sugar Freedom, I knew that the programs worked for me, and for the clients I trained. Now, after taking in-person students and on-line readers through the program, I have seen what you can accomplish with the right fat loss tools, especially if too much sugar, grain, and unproductive workouts have been holding you back. Still, the program is not the solution for everyone who wants to get leaner and stronger, and look younger. If you simply adore traditional cardio and aerobic training, and if giving up bread, sweets, and convenience food is not something you would even consider, then no, this is not the right challenge for you. To those of you who are determined to get off of sugar and starch, and to train less with more purpose and the right level of intensity, I say, “Welcome aboard,” and I promise that you are in for an adventure in self discovery. Mauri, who you see pictured above, lost 21 pounds in six weeks, which is now the record for the challenge. 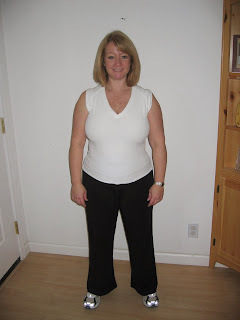 The typical result is a 10 pound fat loss and 13 inches gone in 6 weeks. The minimum result for participants who eliminate sugar and grains and adhere to a training schedule of 3 sessions a week has been six pounds of pure fat gone. I simply can’t wait to see what everyone achieves this time around, and I want to share some important success techniques with all of my readers. 1. Plan your menu each morning. Know what you are going to eat, and commit to it by making the proper preparations. For example, my vegetables for today are going to be mixed baby greens, and sauteed carrot curls. On the Sugar Freedom Plan vegetables make up the majority of the food you eat by volume, and it is essential that you do not skip them! The green salads you eat provide raw nutrients and much needed fiber on this plan. The vegetables cooked in pure fats: pastured butter, coconut oil, or olive oil for example, are filling, and satisfying too. When my clients hit plateaus it is usually because they aren’t eating enough vegetables, or they aren’t drinking enough pure water. 2. Drink eight 8oz. glasses of water each day. If you are not willing to do this, you need to re-examine your commitment to your goals. 3. Review your goals each day. Why do you want to transform your body? How would having your authentic ideal body elevate and enhance your live? Think in terms of your happiness, and also in terms of you your vibrant health and energy allows you to serve you family, your community, and the world. Transformation doesn’t just help you: it encourages and inspires everyone around you. 4. Get out your calendar and schedule your training sessions. This goes for me and all of my clients: Those who don’t miss training sessions always get results. Always. Note: don’t push beyond great form when you train. That prevents the extreme soreness and even injury that can stop you from training. Now, I’m going to leave you with my menu for the day. Remember, as a sugar addict and compulsive over eater in recovery, I have to keep it simple to stay abstinent and keep the 60 pounds of fat I lost 8 years ago off of my body. Morning: Sugar Freedom Tonic, Water, Coffee, 2T organic heavy cream. Breakfast: 2 Eggs, 2 Strips of Bacon, Sauteed carrot curls. 1/3 avocado. 2T salsa. Lunch: Chicken Thigh, Large green salad with olive oil and vinegar dressing. Sauteed carrot curls. 1/3 avocado, 2T salsa. I hope everyone enjoyed their Labor Day 3 Day Week-End. On Tuesday, Sept 8th we begin our 6 Week Sugar Freedom/Little Black Dress Challenge. Whatever your dreams are, it’s time to start taking them very, very seriously. Here at Gordon Studio, developing your fitness, and your figure, is all about living a life full of energy, significance, and fun too. In addition, Craig Ballantyne’s 12 Week TT Transformation Contest is under way, and Gordon Studio clients are encouraged to enter by taking before pictures and measurements. Just request them the next time you come to class, and I’ll get them set up. Here’s to a healthy happy Fall, and to reaching your goals in 2015. One unique feature you’ll find at Gordon Studio is the “Wall of Fame.” Unfortunately, my original before and afters aren’t up there because I lost them in a capacitor meltdown a few years ago. I’m posting these here because we do 12 week transformation challenges with our members, and they always like to see examples of what can be achieved in 12 weeks of smart training combined with a low sugar, whole food eating plan. These pictures show my 14 pound weight loss in 2008, but I have been far surpassed by many of my students! Melinda F., and Jamie P. both lost over 20 pounds in 12 weeks, and they are not alone. Starting August 1st. there will be a change in the Gordon Studio Schedule. This will be posted on the Class Schedule page, but I wanted to post the new hours here as well. Now that Gordon Studio has produced more TT Transformation Champions than any other gym in the USA, and to cover rising costs of running the studio, our rates will be going up in September to $80 per month for unlimited classes. The 8 class punch card will be $60, with 10% discount for Seniors and Students. The single class rate will be $15. There is more great news though: If you join before September 1st. you will get the lower rate of $60 per month and $50 for the 8 class card. This rate stays the same as long as you remain a member of Gordon Studio. Even better, I will be offering a Body Breakthrough Challenge starting Monday, September 14th. For the low price of $59 you get a month of unlimited training, body fat assessment, Sugar Freedom Meal Plans for the entire month, membership in the Secret Facebook Group, a signed copy of “Keep the Change” Transform you body for Good, and a chance to win $250.00 cash for the first place figure transformation, $100.00 for second, and a free month of unlimited classes for 3rd. place. In a tough field of international competitors, Jamie takes 3rd. place in the Women over 40 division. It is always the most competitive category, and I am so proud of her achievement. It’s true, in just 90 minutes a week, you can transform your body. If you also commit to a sugar and processed food free eating strategy, it will happen even faster! See www.sugarfreedom.com for details. Gordon Studio is accepting new students into the 5:15PM, and 6PM classes. Author CatherinePosted on April 11, 2015 June 2, 2016 Categories Body Transformation, Goal Getting, UncategorizedLeave a comment on Jamie Did It! I’ll admit, getting through another candy coated holiday was an eye-opening experience. I mean, I expect to see Easter candy in the grocery and drug stores, but I was certainly surprised by the displays in the home improvement stores. Thank goodness my students, readers, and I have found a way of eating that helps us navigate a sugar and pastry filled world. I’d like to share Jamie’s before and afters with you, and ask you to vote in the 22nd. Turbulence Training Transformation contest. Back in 2007, before I made my own physical transformation, it was seeing Emily Johnson’s before and afters in the 1st. TT contest that made me believe I could make a permanent difference in the way I looked and felt. I hope everyone who has read Sugar Freedom, gone through, the 3 Day Sugar Strike, and followed the meals plans has found relief from the sugar cravings that can drive appetite and overeating. I have found in so many cases that a smart training program can truly take your health, appearance, and feelings of well being to a whole new level. This happened for Jamie when she began doing Turbulence Training at Gordon Studio, and I am including a link is this e-mail if you want to discover the program yourself. With Jamie’s selection as a finalist, Gordon Studio has had students in the finals of the international Turbulence Training Transformation Contests 21 times. That makes us #1 in the US. To current members: keep up the amazing work. If you are curious about TT, e-mail me at 9catherine9@gmail.com, as we have openings in our 8AM, 5:15PM, and 6PM classes. Author CatherinePosted on April 6, 2015 June 2, 2016 Categories Body Transformation, Goal GettingLeave a comment on Congratulations Jamie! Last week I was moving files over from an old computer when I came across this photo. My computer skills have always been a little haphazard, so I’m not really sure when this was taken. It was probably sometime in 2004, when my internet-influenced fat loss journey began. <a href=”http://f6b3cydqd908uwfp4bfgo6t9qd.hop.clickbank.net/?tid=BLOG” target=”_top”>Turbulence Training</a> urged me to do something very effective- take a before photo. No bikini in this one! I post the picture here because I want anyone reading this to know what the woman in that picture knew. She thought she was already beautiful. Recently my sister told me about a conversation she had years ago with our Mom. My sister was feeling distressed over her own looks and Mom told her to be beautiful now. She said that my sister should choose her clothes, make up, and hairstyle based on what would make her feel the most beautiful in that moment, no matter what she happened to weigh. I can say that she has always followed that advice, and as a result I have always found my sister lovely to look at, and from the reaction of people around her she brings beauty with her wherever she goes. Of course now that I think of it, the way she treats people, with kindness and genuine interest, certainly gives the impression she makes a special glow. The process of physical transformation is full of paradoxes like this one: In order to change profoundly, and get all the way to your goal, you must accept yourself completely in this moment. As I come closer and closer to the weight, size, and measurements I have chosen for my goal, have to become even more accepting of myself in order to avoid going completely nuts! My rational mind thinks that with all of the skills and experience I’ve earned over the past seven years the the push to the finish line should get easier and easier. I know how to eat, how to lift, how to move, and even how to think. Indeed those processes do get easier. Go ahead and learn the skills that lead to physical transformation. They do work and they will serve you well, but they may not take you all the way to your goal if your greatest challenges are emotional. If I have to name the greatest emotional obstacle to losing weight for good- it is fear: the fear that when you arrive at your chosen destination the imagined reward won’t be enough. That perfect measurements won’t equal universal acceptance. I think the essential purpose of this blog has been to help me figure out what in the world I’ve really been after all these years, and I thought I found it in the concept of perfect physical well being, something I thought I could go out and create for myself. The great challenge is then to go start doing those very things. I accepted that challenge in July of 2012 when I signed a two year lease on the building that would become Gordon Studio. My students accept that challenge whenever they step into one of my Turbulence Training classes. Yesterday afternoon, we did the finisher that my colleague and friend Mike Whitfield taught to the trainers at the 2013 Turbulence Training Summit. My students had never seen some of the exercises before, and I was so proud of their trust and willingness when they did exercises like the SCREACH, and the Mountain Climber/Burpee combination. Even in those days, if I did my hair, put on my makeup (which I happen to enjoy doing), and wore my favorite color, I felt beautiful. That was, and is, my secret. So as I step onto the fast track toward releasing Sugar Freedom, I have two vital jobs. I have to feel the fear of success and let it pass thorough me without blocking it with food, and I must go ahead and choose to be beautiful now. Go ahead and try it. You don’t have to tell anyone what you’re up to, and it may end up being your secret too. Get Your Best Body Ever- After 40! Rest one minute and repeat 3 times for a total of four rounds (400 reps total). Cross Body Mountain Climbers: 20 Seconds on, 10 Seconds off for 4 rounds. With modifications this can be done by all fitness levels, and they feel incredibly empowered afterward. With TT we can actually get our students to astonish themselves with their own abilities, and when they feel great, junk food loses a lot of its appeal. 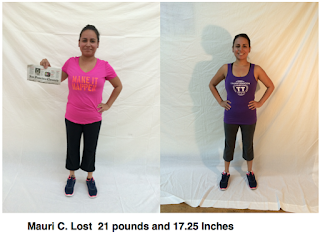 One of my students, Dody, reached her goal weight of 145 pounds last week- down from 161. She said that she wasn’t really aware that it was happening. She knew her pants were looser- a lot looser, but that the 145 on the scale was a shock. Simple- total commitment to Sugar Freedom, no cardio except walking, and TT. After I met with my fitness colleagues in Las Vegas, I made a promise to myself that I would eat, train, and teach in a way that I know to be consistent with the best current science, and with my experience, and that of the most successful trainers and coaches I can study. Do you want to teach what is popular, or do you want to teach what works? Two years ago, I made a choice to teach what was popular, and I lost the body of my dreams when I slowly but surely re-gained 15 pounds over the course of the following year. I don’t think it’s coincidence that I finally got my weight back to goal range after I took a break from the cardio/aerobic classes I had been teaching. My transformation happened after age 40, and what I have to accept once and for all is that, for someone like me who is susceptible to obesity, steady state, moderate intensity cardio sessions that last an hour or more are simply not an option if I want to maintain my fat loss. The proof is right in front of me when I see my Turbulence Training students get leaner, stronger, and dare I say it, great looking bodies week by week. Women in their teens, twenties, and early thirties may be able to cut their calories to the bone and do as much cardio as they want, but I have to accept that at almost age 50, I can’t. So with patience, good technique, and the right eating strategy for your body, you a can get to your goal weight after 40 and beyond. And the best news is that that you can enjoy the journey. Author CatherinePosted on September 29, 2013 Categories Goal GettingTags Fat Loss, Lose Weight, Transformation Contest, Weight LossLeave a comment on Get Your Best Body Ever- After 40! You Can Lose Weight When You Travel. If you’re new to the Gordon Studio Sonora Website, welcome! If you’ve been reading this blog for a while, you know it’s dedicated to helping you build your authentic ideal body, and keep it for good. One of the biggest challenges of weight maintenance is learning how to eat when you’re out of your usual habitat. After all, one of the most powerful keys to permanent fat loss is learning how to cook healthy, satisfying food for yourself and your family, and generally home cooking has to happen at home. It’s not boasting when I say that I have my food and cooking plan dialed in. Typically, I make my big pan of vegetables in the morning, I make sure I have lettuce washed and ready for my mid-day salad, and I make sure I have a healthy protein source ready to go at any time. It’s no fun to have to thaw and cook a chicken when you’re already hungry. This is, to put it simply, is the discipline of permanent fat loss: to be willing to prepare for success. Traveling for work or vacation is a different story though, isn’t it? One of the perks of travel is that someone else is doing the cooking and cleaning up afterward, right? One of the problems is that the food on offer is typically part of the Standard American Diet: Lots of grains, conventionally raised meat, salty snack foods that are full of soybean oil, and sweets. I suppose that one solution would be to book a room with a kitchen, go shopping, and just keep cookin’, but what if you need a break from that, or what if you’re having working lunches? I’d like to offer a few of my travel friendly foods, and a few tips to help you make wise choices at restaurants, buffets, and even airports. These three items can go in your suitcase or carry on, and the three different textures and flavors are very satisfying. I have literally made a mini meal of these three foods, and tumbled into bed after a long work day- especially if that workday involves learning new workouts and fitness techniques. So now that we know you won’t starve, what should you pick at the restaurant of buffet? Let’s keep it simple shall we? Although breakfast is often a carb fest on the road, there are usually some whole foods like eggs, bacon, and fruit available. At lunch, eat a big salad for the fiber and nutrients the leafy greens will give you, and at dinner- if you focus on the pleasure of the location, or the opportunity to grow professionally, you really don’t have to eat dessert. If you’re like me and you don’t eat sugar but you love cheese, ask for it instead. At steakhouses in particular, cheese for dessert is definitely in style. The simple foundation of the Sugar Freedom Diet on the road is: Vegetables cooked in butter, Salads dressed in olive oil and vinegar, simply prepared meats of the best quality you can find, whole fruits, and some full fat dairy if it agrees with you. Ten years ago, it would have been hard to eat this way when traveling, especially at airports without a full service restaurant. Today, whole items like fruit, eggs, and vegetables are pricey- but at least they’re available at airport food courts and convenience stores. I hope these eating tips help, because five extra pounds of travel bloat is not my idea of a charming souvenir. I lost two pounds of fat in Las Vegas last week. That helped to make up for losing some money in the casino. Oh well. That’s entertainment! Author CatherinePosted on September 17, 2013 Categories Goal GettingTags Fat Loss, Lose Weight, Sugar Craving, Weight LossLeave a comment on You Can Lose Weight When You Travel.